Enhance business unit productivity even while using older versions of Microsoft Dynamics 365/AX. Map your business’ processes, confirm that they cover all real-life-demands, and show how the map differs from your current perspective. Optimize the key processes within your system while improving speed and performance. Identify how your highly customized application can potentially be simplified. Pinpoint potential threats that can impact business processes in the current system architecture. Determine whether to further develop the current system, or migrate to a new version of the system. Select the design approach for transition to a new Dynamics 365/AX version. 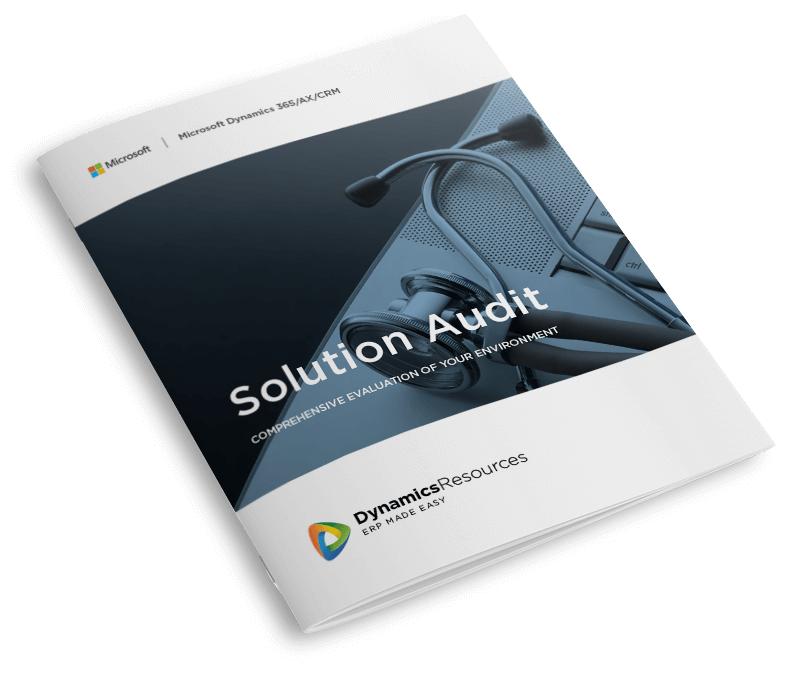 Microsoft Dynamics 365/AX Audit provided by Dynamics Resources allows you to get an assessment of the current state of health of your Axapta environment and prospects for its future development. User confidence was low due to numerous data discrepancies. Labor costs increased as the IT support team managed data errors. During the audit multiple functional and technical problems, as well as their causes, were identified and addressed. The customer was completely satisfied with the audit’s findings and decided to continue using Microsoft Dynamics AX once the system was modified instead of starting over with a new system. A significant portion of the technical work was performed by in-house specialists under the keen guidance of our efficient, detail oriented experts. The standard function, Period Closing, was not activated. This allowed users to manually change data within the system, causing inaccuracies in the system as well as ripple effect inaccuracies in reporting. There were many inventory discrepancies between stores and distribution. Custom modification errors violated standard inventory calculations within the system. Batch, a standard function, was activated, but executing improperly. Goods receipts were posting when product shipped instead of arrived. The combination of the above issues was bogging down system performance. Once adjustments were made, the system executed correctly and confidence abounded. More than 15k integration errors between the stores and headquarters were identified. The accounting structure integration was streamlined for optimal results. Redundant objects that were created during the test process were identified and removed from the database to improve performance. Old version objects were deactivated. Incorrect server RAM configurations were corrected. The RAID configuration had not, initially met Microsoft’s recommendations. This was remedied. The SQL queries monitoring detects a number of heavy queries without DB indexes. Non-optimal OLAP-cubes structure were identified. Once adjusted, long cube processing times were reduced.